Watch talented interior designer Leesa Wilson Goldmuntz stage a beautiful Contemporary Montecito home on Design Santa Barbara. Leesa has been obsessed with houses and their contents since she was a child. Furthermore, leesa has lived and worked in six cities and on two continents. Blending successful backgrounds in fashion design and buying and residential property development she brings not only a critical eye to her work but a respect for the bottom line. Specializing in assisting agents and sellers with luxury homes and estates, Leesa and her team transform spaces to reflect current trends with furnishings that represent the expectations of today’s discriminating buyers. Projects range from furnishing unoccupied multi-dwelling estates to adding pieces that compliment existing furniture. Our goal is to help show every residence in its very best light. At Santa Barbara Design Center we carry over a hundred fabrics to choose from to custom make your sofa. In addition, you can choose from Down, angel hair and poly wrap depending on the firmness or softness you want your sofa. In this vignette, Leesa customized a gorgeous U-Shaped sectional that fits at least 8 people. In this room you have a wonderful seating area where you can enjoy the amazing view and the warm fireplace on cold, rainy days. 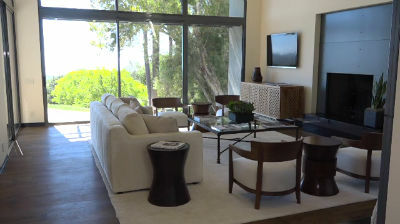 In addition, sofas can be custom made at Santa Barbara Design Center. Enjoy your family time in a comfortable sectional sofa perfect for any home. Add more sitting space for you and your guest to enjoy comfortably. Make the most of your living room with one of our comfortable sectional sofas. In conclusion, at Santa Barbara Design Center we have modern and contemporary sectionals that range of styles and colors. We custom make sofas to your specifications.